​It is impor​tant to fuel your body with proper nutrition and water - before, after and during a race. Dr Darren Tay from Singapore General Hospital shares some tips. up to 250 ml in small sips at regular intervals to re​plenish lost fluids during a race. For a successful marathon, it’s critical to fuel your body with proper nutrition and keep it sufficiently hydrated before, during and after the race. Before any big race, build up your energy reserves by loading on carbohydrates, starchy vegetables, fruits and lean protein for three days. Inexperienced runners often make the mistake of taking heavy meals the day before the race. Overeating can overwhelm your digestive system. You may feel bloated or nauseous during the race. Have a low-fat, high-carbohydrate and low-fibre meal about three hours before the race to prevent any indigestion, fatigue or stomach discomfort whilst running. Avoid heavy meals the day before the race and only eat familiar foods on the day itself. Bread/toast, bagel, peanut butter, fruit without skin (banana), pulp-free fruit juice or sports drink for a pre-race breakfast. Rice, pasta, lean meat, starchy vegetables, fruits for “carbo-loading” at least three days before the race. For hydration, drink 500 to 700 ml of fluid about three hours before the race. Deep fried foods, foods high in saturated fats (red meat, processed foods like bacon, sausages and pastries). Avoid dairy products (milk, cheese, yoghurt) on race day if you have a history of gastrointestinal problems. Some marathon runners skip morning coffee as it is diuretic. ​Because the body uses more energy digesting fatty foods, your race performance might suffer if you consume excess fats. Energy bars, energy gels and bananas are excellent for replenishing carbohydrate during a race. Take small bites while continuing the run. Keep yourself hydrated. Dehydration occurs when water lost through heavy breathing and perspiration is not replaced adequa​tely by fluid intake. You may lose up to 3 to 5 kg of water weight in a three-hour marathon. Take another 300 to 600 ml of fluid 15 minutes before the race begins. Drink 150 to 250 ml of fluid at regular intervals to replace fluid loss. Take small sips while continuing to run. Fluids include plain water (for runs lasting less than 90 minutes) and sports or isotonic drinks (for longer distances such as marathon). Avoid soda, fruit juices and cordials. Their high sugar concentrations may delay gastric emptying and cause stomach discomfort during the run. 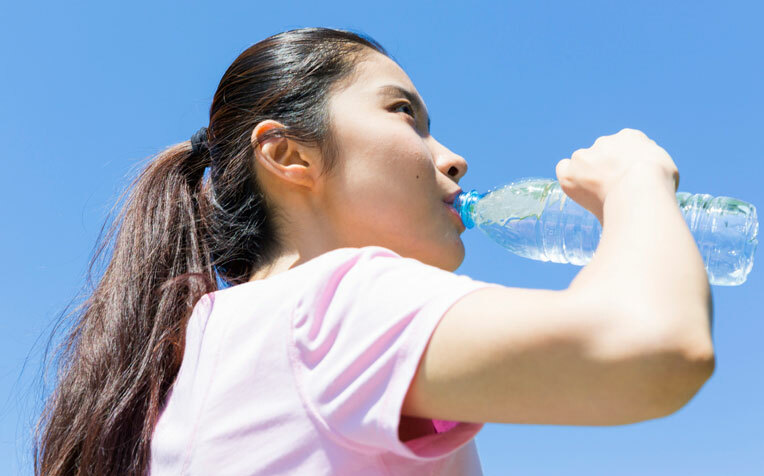 Hydrate with sport drinks after a marathon. Isotonic drinks are preferred as they contain similar concentration of salts and sugar as the human body. Avoid alcohol in the 24 hours following a race, as it promotes dehydration. Do not drink just based on your thirst, as it won’t reflect all of your fluid needs. For a visual guide, your urine should be almost colourless a couple of hours after the run. Within one hour after a race or marathon, grab a carbohydrate-rich snack such as banana sandwich, red bean bun, energy bar, peanut butter on a banana and a sports drink. Within two to three hours after a race or marathon, have a balanced meal comprising a lean protein (fish, chicken), carbohydrates (rice, pasta, potatoes) and good fats (avocados, nut butter).